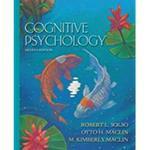 MacLin, M. Kimberly and Solso, Robert L., "Cognitive Psychology" (2007). Faculty Book Gallery. 475.